The 'Last chance gulch' had now become the place to stake your claim for gold. Virginia City soon lost its appeal and became a 'ghost town' in the space of a few years. It went from a population of 15,000 at its peak to around 500 at its lowest. Today it is in the hands of the state and has has many of the original buildings still intact frozen in time. For more info and to see some of the excellent work they are doing please visit the website of Virginia City here. The 'Last Chance' had about 200 settlers by winter, they were building houses, saloons and shops to facilitate the flourishing camp. The name 'Last Chance Gulch' wasn't going down well with the new folk, so a meeting was set up on 30th October 1864 to discuss a name for the maturing camp. Reginald wrote to the Helena Weekly Herald in 1882, explaining how the name came about. Below is a passage from those letters. "I well remember the night we assembled in Mr Wood's cabin to give our embryo town a name. Not much time was wasted in talk and no time that the honest miner of that period was not a long winded animal when put upon the stump. Not in that sense of the word, though decidedly he is in another; generally it was but a few words and to the point." "As a preliminary skirmish a few names were facetiously suggested by different members of the meeting not seriously intended, such as "Squashtown" - "Pumpkinville" (because it was around the time of Halloween these names were suggested), and the names of some of those then present, but the interest of the meering became at length confined to two - "Tomah" and "Helena". The name of the first has long slipped from my memory. To tell the truth I have since gravely suspected that "Tomah" was merely an abbrevisation of the common "Tomahhawk"." "As your article says, it was Uncle John Sommerville who proposed "Helena". I do not think I had seen him before that evening, at any rate to know him, but I was struck with his appearance. Tall and jovial, his hair grizzled with the years, he looked the picture of an old back woodmans. I was informed that he came from Minnesota, from a town on the south bank of the Minnesota river, where he had been an editor of a paper. Among other things, he sedately informed us that Helena was a word of Greek derivation, and signified "a town in the interior". I knew just enough of Greek to have serious doubts about his interpretations, but did not feel sure enough to mention a contradiction, even if I had felt so inclined. "It ran a very close heat with "Tomah" in the ballot and only won by a vote or two. I regret to say that I seconded the losing proposition, my reason for doing so, as opposed to Helena, being that there was already a town of some importance of that name in the United States. Helena it was, and Helena it no doubt will be, to the end of time." 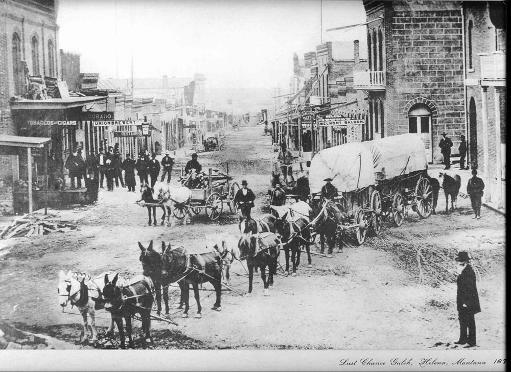 The next few years would see in the region of $3.6 billion dollars worth of gold mined from the gulch and in less than 20 years there were fifty millionaire living in the settlement. Montana had become a territory of the United States and Virginia City had the privilge of being the first capitol of Montana. 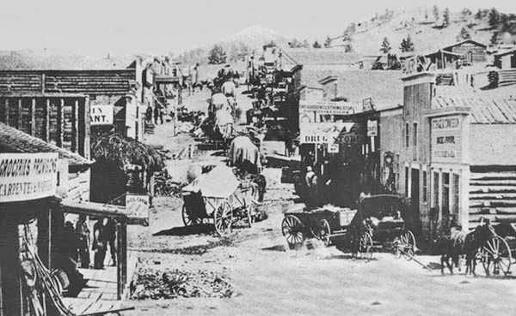 But as the gold dried up in Virginia City and the population dwindled, it was decided that the capital should be changed to Helena and in 1875 the change was made and that sealed the fate of Virginia City.